you never know when you may need roadside assistance. St George Tow Truck Company offers 24 Hour roadside assistance in St George and the surrounding areas​. No matter what time day or night you can rest assured that we will be there to assist you with any and all of your roadside assistance needs. Life can be crazy at times and sometimes it is hard to always be prepared for every type of situation that ma y come up for you on the road. It is important for us that you know that we always have you back whenever something unexpected happens you you on the road. Being stuck on the side of the road seems like you are there forever even if you have only been sitting there for five minutes. Here at St George Tow Truck Company it is important to us to be not only reliable but also quick. We know hat you are calling us because you day or night has been interrupted with some sort of car trouble. We feel it is our job to get you back on the road and on with you day as fast as possible. 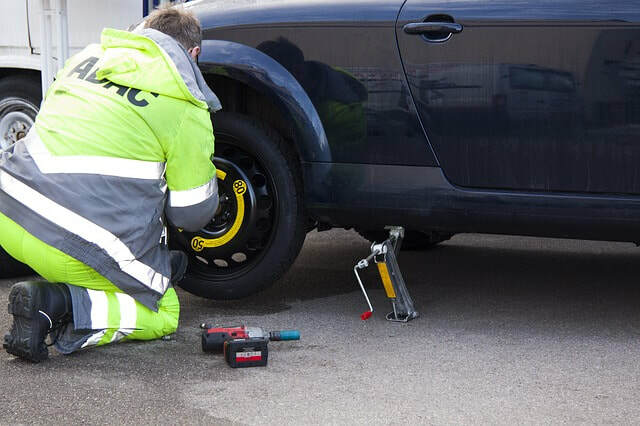 We know that dealing with any type of issue on the side of the road where you are calling us for roadside assistance is a huge inconvenience to you. Taking care of you and providing the best roadside assistance as fast as possible in the safest way possible is our top priority. So give us a call today and we will ensure you fast and reliable roadside assistance of all types. Getting a flat tire while driving or having a tire blow out while driveing can be a very scary event for anyone. We understand not everyone has a spare tire or maybe not everyone knows how to change a flat tire. Maybe you do know how to put on a spare but you are not dressed to get grease on your clothes or maybe you are headed to work or an important meeting or event. Do not get you clothes dirty or rip you clothes changing your spare tire. Call St George Tow Truck Company and our flat tire specialists will ensure that we get you flat taken care of as soon as we can get to you. We can get your spare on or tow you to a tire shop to get a new tire or get your tire repaired if that is an option for you. We want to ensure that we are thorough with any and all the roadside assistance needs you call us out for especially a flat tire. St George Tow Truck Company is very knowledgeable in all different road side assistance needs. We just mentioned replacing a flat for you but there are so many other needs that come up on the side of the road that we cover. If you have never run out of gas on teh side of the road you are not like most of us. If you need us to bring you gas so you can get to the nearest gas station then we are there for you and can get you gas to get off the side of the road. Did you lock yourself out of your car at the grocery store or at work and you do not have time to wait for a spare key or do not have a spare key. We will send our lockout experts to unlock your car and get you on with your day. Maybe your car is over heating and you need a tow truck to come and take you to the nearest mechanic you trust. Here in Utah we know sometimes those winter storms can come out of nowhere and you can slide off the road and get stuck in the snow. We are there to come bail you out and make sure that you are safe to continue on. No matter what you need if you need any type of assistance on the side of the road we will be there fast to help you. We feel it is important that you know you can count on St George Tow Truck Company to take on any of your roadside assistance needs with professionalism and speed. you can rest and have peace of mind that you know a honest company that will always be there to assist you on the side of the road when anything happens to your car that is not only frustrating but a huge inconvenience to you. We are here to lighten the burden and take away the stress, getting you back on the road fast. Your roadside assistance needs are sure to be met in an effective manner.